Getting Your Workout And Cardio Plan In Line For The New Year! Some may want to diet hard and lose the last bit of body fat while others will want to change their training routine. This is a great time to make changes to your training routine for maximum results! Here are some suggestions. Chances are you have already started thinking about what you would like to do with your training program in the coming new year. 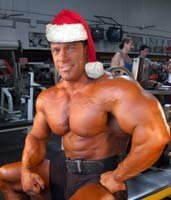 Some people may want to start on a hard diet to shed that last bit of body weight that just seems to stick around year after year while others want to make this the year they finally put on the muscle mass they have been desiring since hitting puberty and finding it just didn't come on naturally. The best part about the New Year is that you have two things working in your favor. First you have the kick-start motivation that most enjoy in January. I'm sure you've witnessed this before when you step foot into your gym and it's more packed than the shopping malls were on Christmas Eve. Everyone and their dog seems to want to make up for their indulgences over the holidays. Everyone's At The Gym in January! Therefore, with your motivational levels higher, you are more likely to at least follow your new program for a few weeks into the New Year (and hopefully more). The second advantage you have here is that since it's the "New Year" you will likely develop a new workout plan for yourself. Far too often individuals will see fitness gains simply by doing this alone. 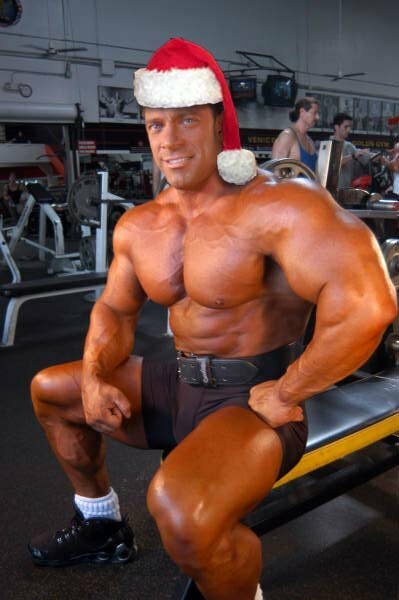 You may have gotten into a workout rut the last few months, whether it was because you were being busy preparing for the holidays, writing exams if you are a student or other areas in your life that demanded attention from you, you never gave a whole lot of thought to your workouts and just kept puttering along doing the same thing day in and day out. By switching it up, you are going to shock your body and discover results you have not seen for a great period of time. When coming up with a new workout plan, take into consideration what you have been doing for the last few months. If you have been on a high volume lifting plan then it would be a good idea for you to look into something that was lower volume where you hit your muscles hard then give them plenty of rest. Oftentimes people on high volume workouts are not recovering fully between sessions and therefore have not seen the strength gains they could see. Upon doing a lower volume program, they almost immediately see results simply because their body has enough time to recover, so they almost begin to overcompensate in strength, making up for their last 2-4 months of training where they weren't. Similarly, if you have been doing a low volume program, you may want to shock your muscles with various volume techniques such as super sets, dropsets or pyramid sets in an effort to really stimulate the muscle fibers in a method they are not used to. If you have been using a split-body-part program, giving a full-body workout performed three times per week is another great choice. This will free up more of your time so you aren't in the gym as many days per week but are still getting great workouts. Another advantage with a 3-day full-body workout is that you are going to hit your muscles with an increase in frequency. The best way to make a muscle grow is to train it as often as you can without sacrificing recovery. Any time you train a muscle before it has fully recovered you are not going to see the growth you should so this point is important. A Full Listing Of 3-Day-Per-Week Workouts! With the 3-day program you will have at least one day off in between therefore ensuring that you get some good total rest time in. While 4-day split programs, such as upper/lower or push/pull are great since you can target specific muscles slightly more than you can with a full-body program, the frequency is going to be lower. What Are The Major Differences Between 3 And 4-Day Splits? When it comes to your cardio training - for some you may have simply slacked on doing this so just getting back into it is going to be a good goal for you. Other individuals who have kept up their cardio may be looking to now push it to the next level. Just remember however that you really should only try and improve one aspect of your fitness at a time (if you are an advanced trainee), be it cardio or lifting. Since most cardio work with regard to improving cardiovascular ability is going to oppose properly building muscle (either by training the muscle fibers in a different way or interfering with proper rest time) it is not the best idea to combine them. If you are happy with your current muscle size then try incorporating some high intensity interval training into your workouts. This will not only improve your cardiovascular fitness but also send your fat loss progress into high gear. If endurance training is more what you are looking for, you should still incorporate some intervals into your program; intervals are also great for helping your body learn to deal with the build up of byproducts so your longer sessions seem easier. So whatever your goal is, be sure you take into account what your prior training plan was like. This will give you a great indication on some of the things that you should consider changing and why you may have not been previously seeing the results you were hoping for.